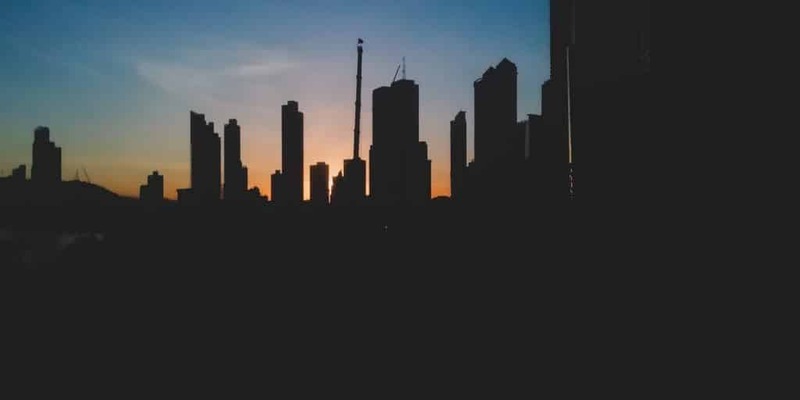 Panama City in Panama is a booming tropical metropolis jam-packed with mega-shopping malls, a tangled mess of grid-locked roads and countless glistening skyscrapers all vying for attention from the sky – the ‘Dubai of Central America’. As such most tourists and backpackers sadly feel there is not much here for them to do, with no authentic culture on display! Thus they only use Panama City for its well-connected international airport to start or finish their trips, hopping on the first bus or flight out of town before they have even gotten to see the sights. To me, however, this is a completely missed opportunity as there are plenty of awesome things to do in Panama City if your only willing to look for them! 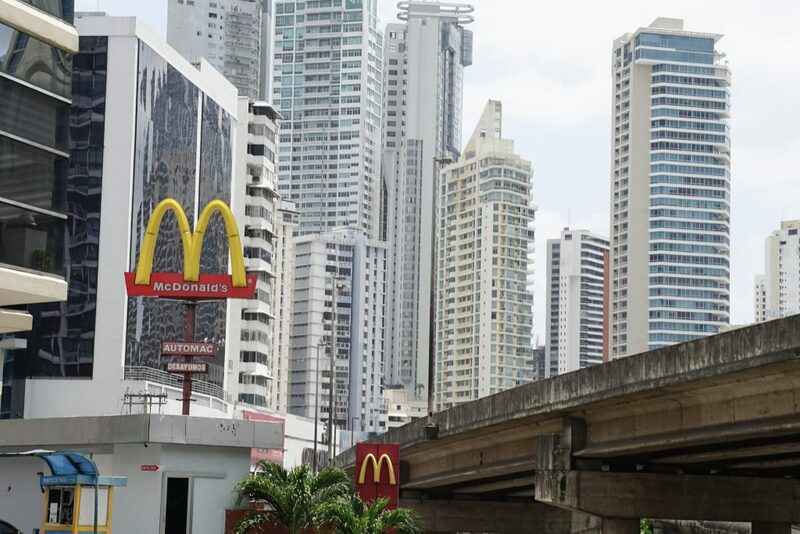 I recently spent 10 days in Panama City and was surprised by how much this seemingly sterile city had to offer if you were really willing to put in just a little effort. Sure, the city is not exactly pedestrian friendly, and still has a few sketchy areas, but in return for your efforts you are rewarded with incredible sights largely free from giant tour buses and loudspeakers. These are place where often you are only in the company of locals who, by the way, are always ridiculously friendly and excited to show off their glimmering, modern city. For those of you looking to get to know the city beyond the canal and the now infamous Panama papers, I present to you, in no particular order, 12 Unmissable Things to Do in Panama City! Where To Stay In Panama City! 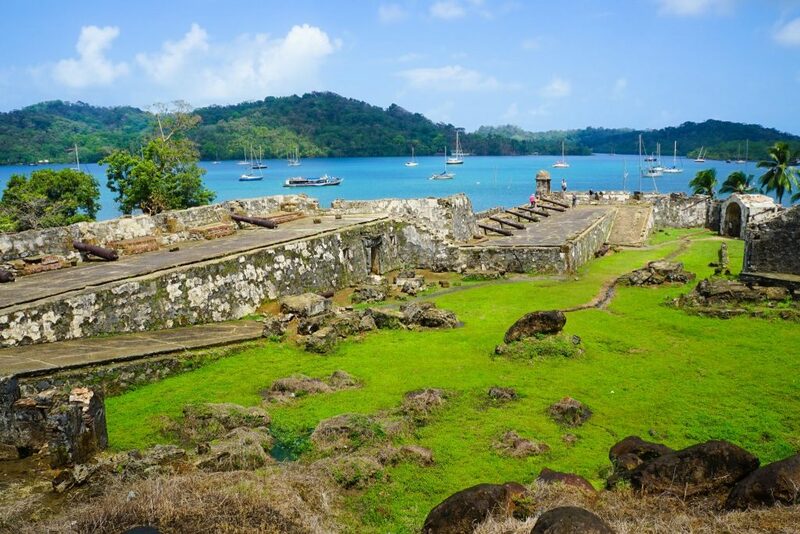 A glimpse back in time, Panama Viejo is the oldest European town on the American mainland. Sadly ruined by fire in 1672 and then lost to time, the remains of this historic place has now been renovated and the entire town is now an open-air museum you can wander around and explore at your own leisure. Panama Viejo is a UNESCO World Heritage Site, one of my travel passions – Check out the other 250+ UNESCO Sites I have been to here! Little old Panama City is nothing like any other Central American country and it honestly seems like it would be more at home in Asia or the Middle East at times. Panama City currently has over 60 super-tall (150 meter+) skyscrapers with many more in the works – Expect it to change rapidly in the coming years as the Panamanian economy shows no sign of slowing down! 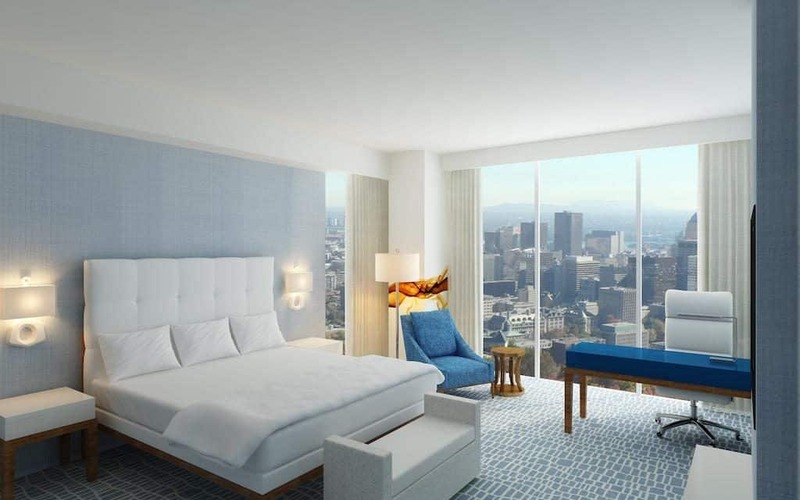 The Hotel JW Marriott Panama at 284 meters is currently the cities reigning ‘king of the tall’ and offers one of the cities ultimate views. However, no matter where you are in the city you will have a completely different vantage point and be able to feel tiny amongst these towering steel beauties! 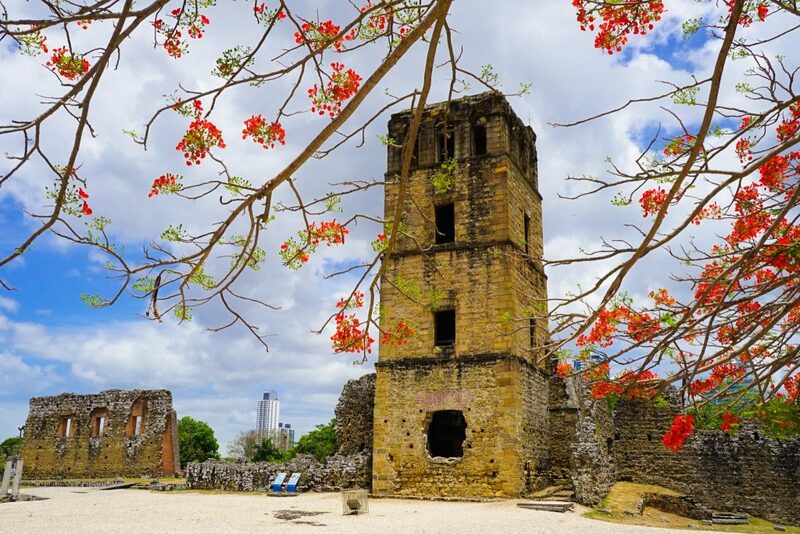 An easy day trip from Panama City, get some fresh Caribbean air as you explore 17th and 18th military fortifications built to protect the Spanish’s lucrative gold trade from enterprising British Pirates. The ‘old’ town of Panama after the loss of Panama Viejo to plundering pirates – for many years this area was one of the cities most dangerous as the urban elite left in droves for the new, skyscraper city across the bay. 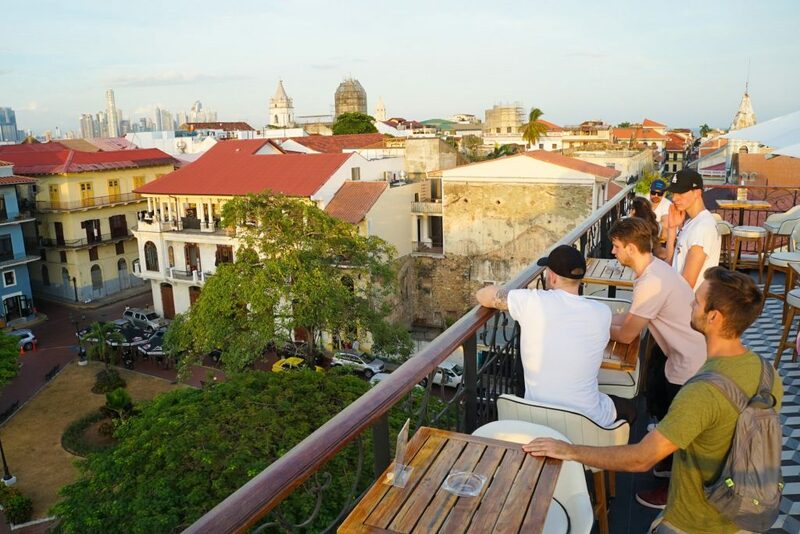 Rapid gentrification recently, however, has again brought back the glitz and glamour and now decrepit ruins sit happily next door to 5-star hotels – though one suspects in fast-moving Panama City this won’t last for long. 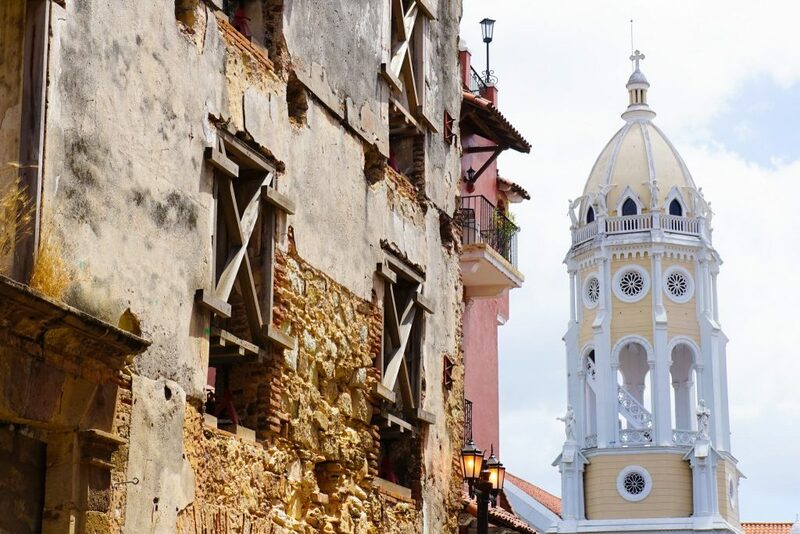 The destination for food and nightlife in Panama City, Casco Viejo should be seen by both day and night. Once part of the U.S Panama Canal Zone this hill, the highest in the city, now proudly flies the Panama National flag. Not only is it the best lookout in town but you can spot plenty of wildlife including deer, sloths, and monkeys. Keep your eyes peeled! 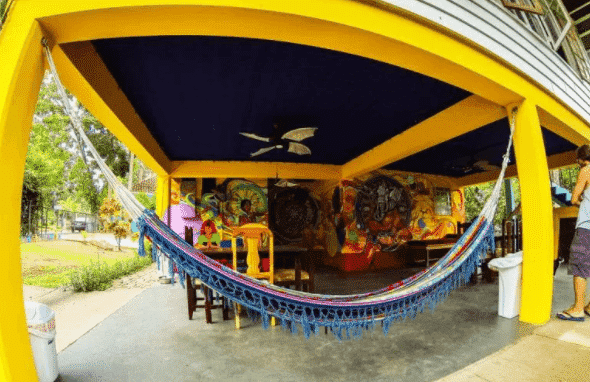 If you are looking for a unique stay in Panama in a quiet wild-life filled neighborhood check out my full review of Casa Nativa Hostel. 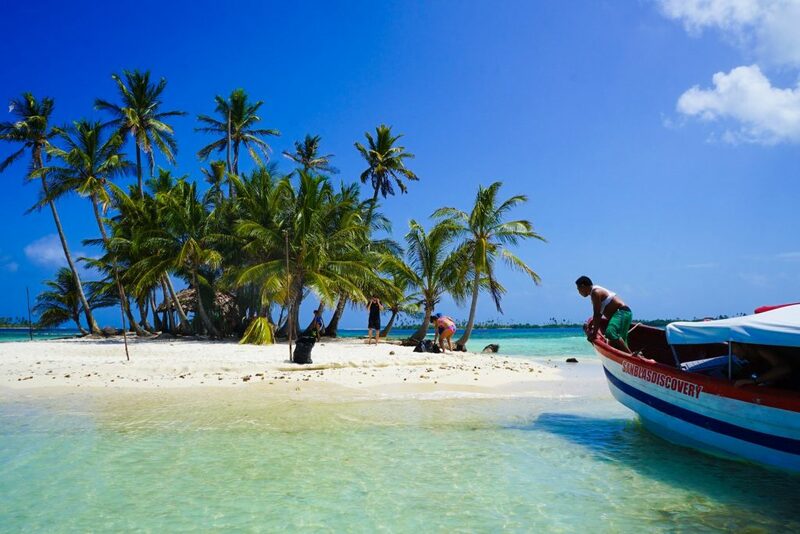 Have you heard of the alluring San Blas Islands of Panama, locally known as Guna Yala? Post-card perfect, deserted white sand beaches floating in a turquoise ocean – a little piece of paradise only a few hours from Panama City. The area, a remote indigenous territory consisting of 365 islands, is accessible on a day-trip from Panama but for the best experience, a few days of rest-and-relaxation is called for! For something a little different why not consider a trip from Panama City to Colombia via the San Blas Islands? 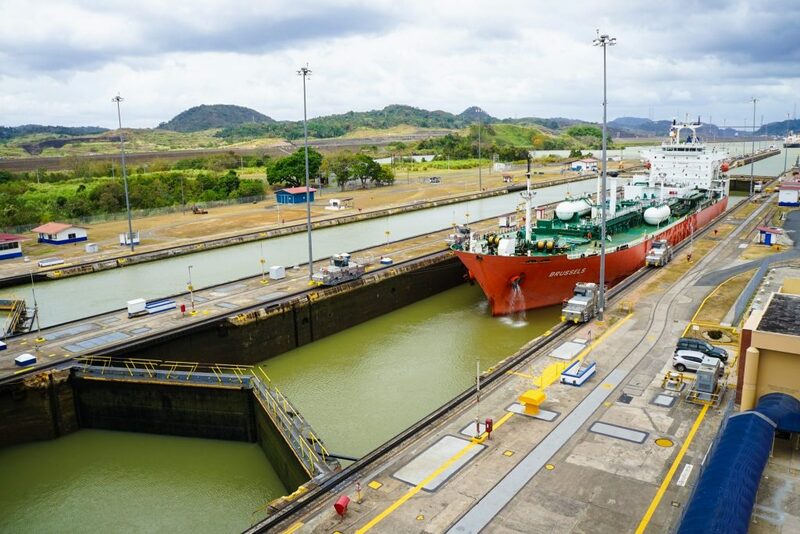 What would Panama be without its canal, or even the world as we know it? See globalization in a physical manifestation as 40+ cargo, oil and cruise ships pass through these historic locks every day. Quite the site to behold! Tickets are $16 USD but to see the Panama Canal on the cheap tell them you are just going to the restaurant (open from 12 daily) – then avoid the expensive buffet and ask to go to their open-air ‘just drinks’ section for a relatively cheap beer or coffee. Sure you miss the 12-minute film and a rather average museum but you will still get to see these monster ships glide past you! P.S. The lock changes directions from 11 am to 2.30 pm daily so best to avoid these times as there is not much to see! 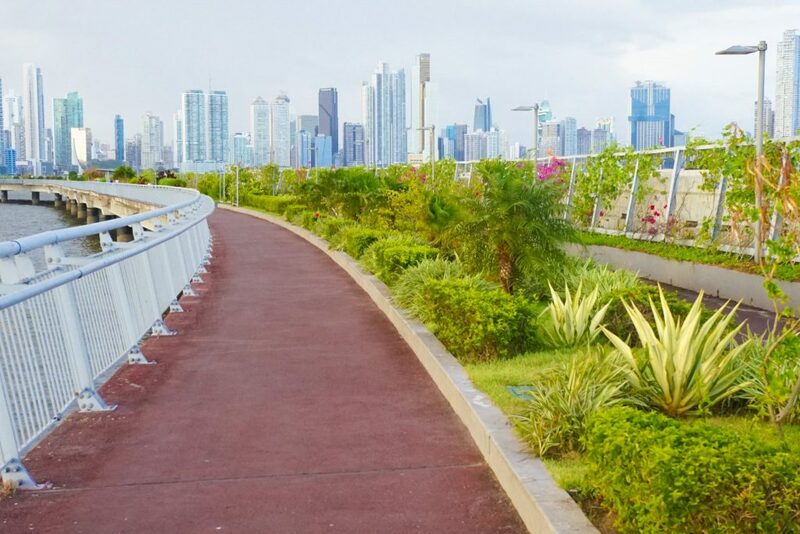 While Panama City seems to be an urban planning disaster in which the city wages war on pedestrians one glimmer of hope is the Cinta Costera – an 8 km long waterfront path of uninterrupted walking, cycling and people watching. 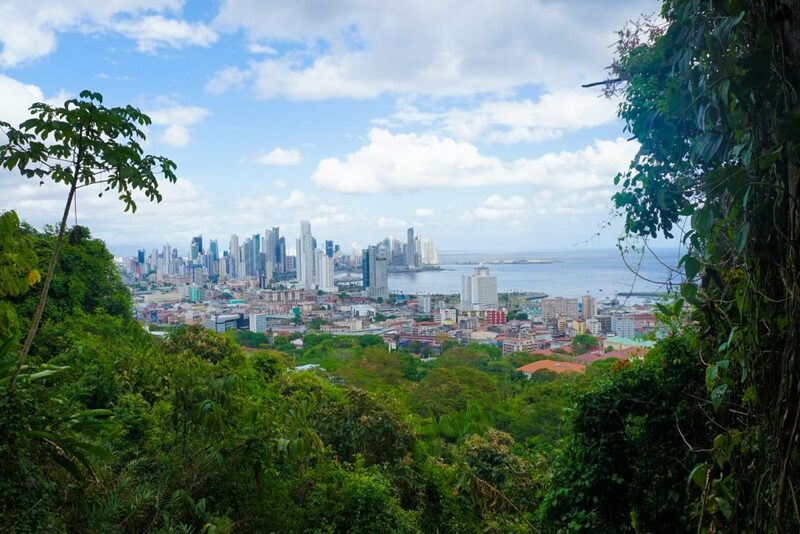 With stunning views of both the old and new town, this is one highlight of Panama City not to be missed. Go around 5-6 pm to avoid the heat and enjoy this beautiful place with Panamanian locals! After five minutes in this city, you will realize it is complex, rapidly changing and has plenty of hidden secrets. 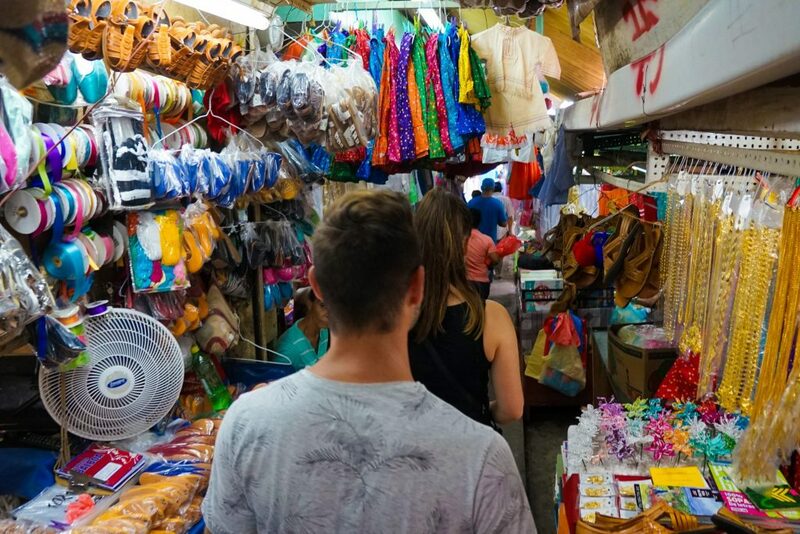 However, such secrets are not often easily revealed to tourists so Joey, who runs PTY Life – Panama City’s premier source of lifestyle and travel information – decided to help visitors discover the real city off-the-beaten-track. You’re guaranteed to see hardly a tourist in sight here and experience something unique and different on every tour! Check this out you want to learn more about my time exploring Panama City Off-The-Beaten Track With PTY Life. 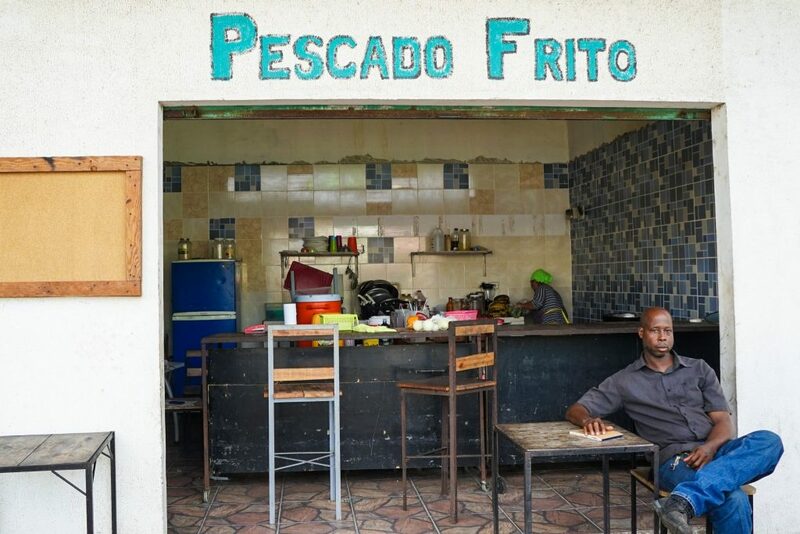 This diamond in the rough has, without a doubt, some of the best seafood I’ve ever tasted in the world! I’m not even exaggerating here! Danny, the owner / ingenious chef originally from Brooklyn, is quite the character and it’s also handy he is fluent in English – Trust me, you are in good hands here! You can easily arrive with Uber by putting “Peach Fuzz International” as the destination. Peach Fuzz International opening hours are Tuesday to Sunday from 12 pm – 8 pm. 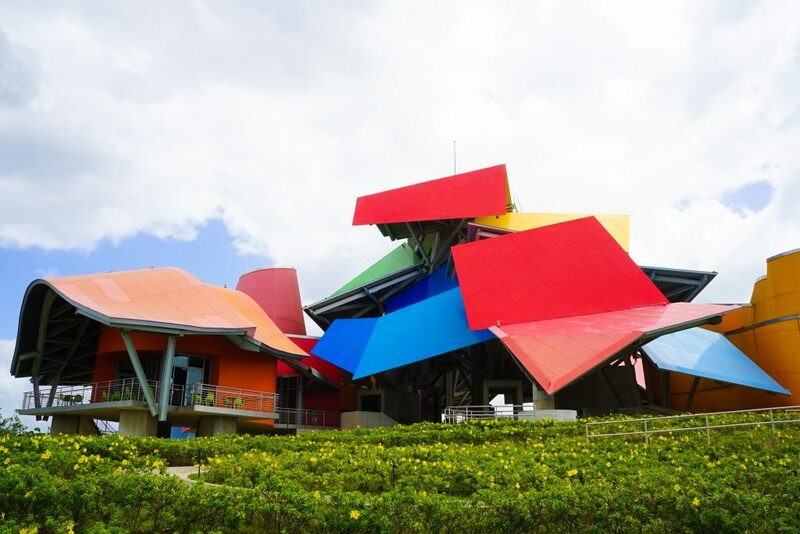 A tangled mess of color, the Biomuseo – one of the cities modern icon’s – was designed by renowned architect Frank Gehry and was his first design in Latin America. 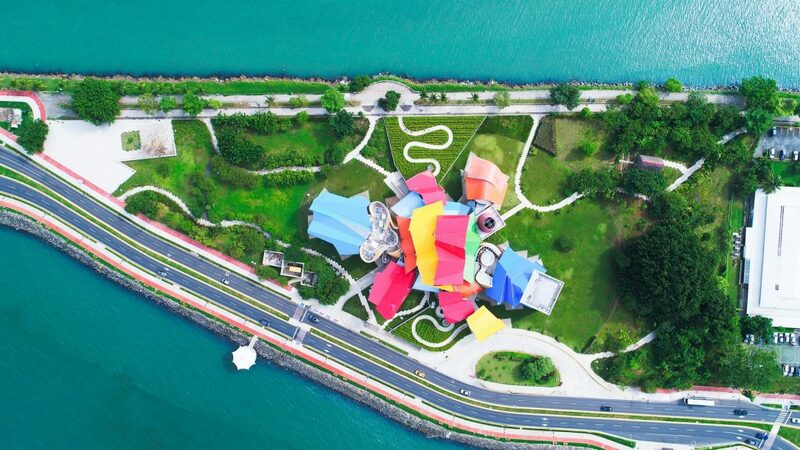 Opened in 2014, the unique design was given freely by Gehry to the people of Panama, reportedly because his wife is Panamanian. The Biomuseo has 8 exhibitions that largely revolve around Panama’s biodiversity, many of which are curated by the Smithsonian Institution and the University of Panama. You can’t leave Panama City without combining two of its best attributes: killer views and great nightlife! Whether you want to soak up a relaxing sunset or party until the wee hours of the morning Panama City has you covered! The tropical climate means roof top bars are open and pumping all year around. For an up-to-date view on the current selection in the city check out this guide to roof top bars by PTY Life! Featuring an outdoor swimming pool and 5-star amenities, Grace Panama is the current ‘It’ place to see and be seen. Perfect for vacations or business. The Best Western, but not as you know it. 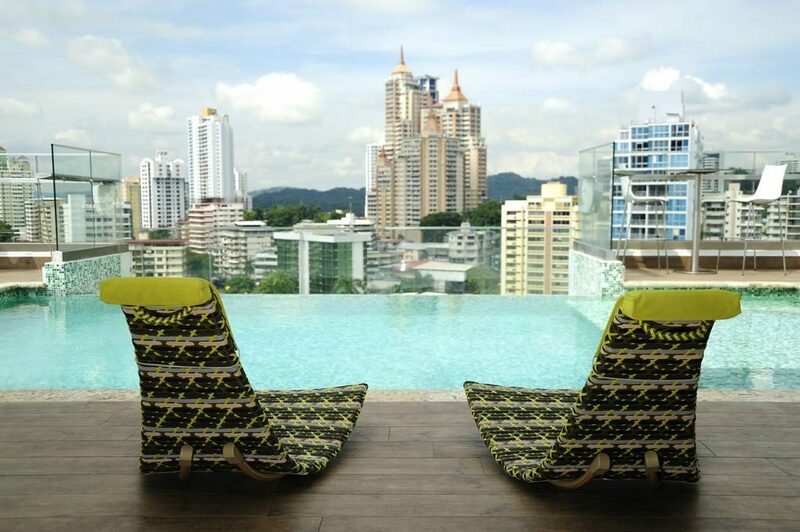 While the location is a bit out-of-the-way its infinity roof-top pool is to die for and the hotel itself is super chic. A must-stay! Affordable dorms, single and private rooms in a quiet suburban neighborhood. Clean, 24/7 security and Fast WiFi. Only 5 minute Uber trip to the old town. 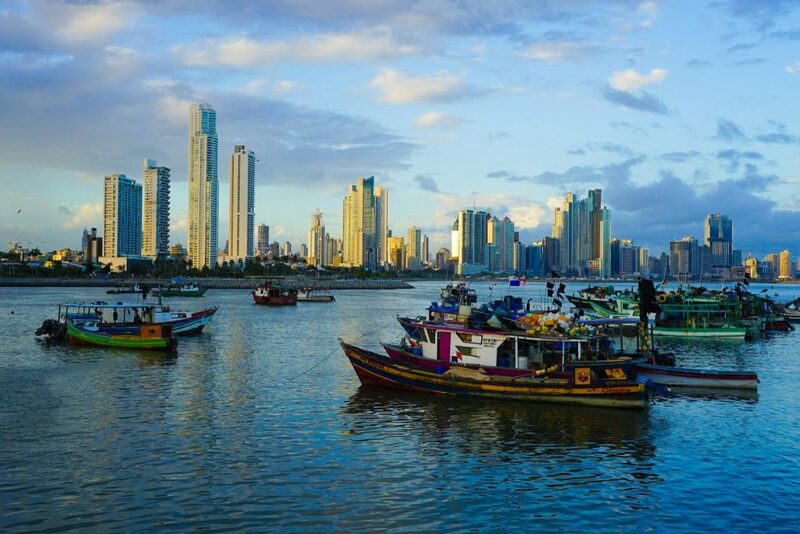 There you have it – 12 Unmissable Things to Do in Panama City! The perfect way to spend a week here and really get a feel for the cultural hub of Panama! 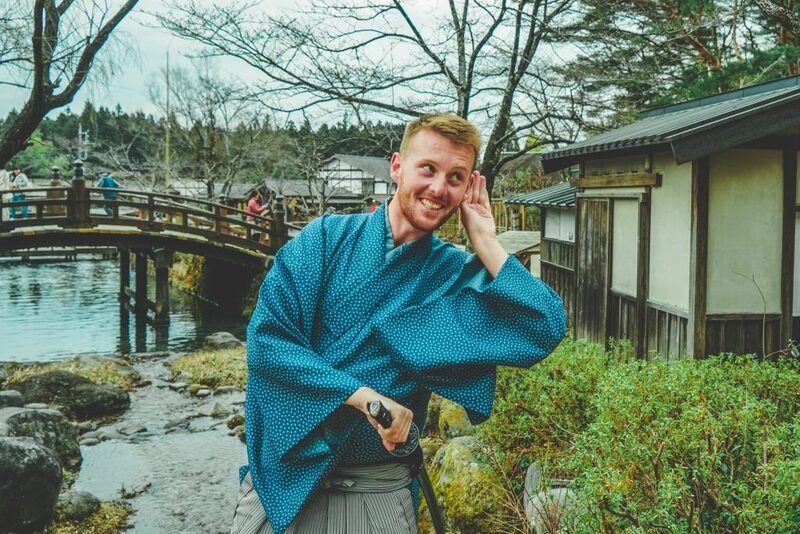 Let me know in the comments below what your favorite places are, and as this rapidly changing city adds more attractions please keep us up to date so I can change this article! Can’t get enough? Here are some other Panama things you might like to read!